We’d love your help. Let us know what’s wrong with this preview of The God King by James A. West. Steeped in tragedy and hardship, mercenary Kian Valera wants nothing more than to hang up his sword. But he cannot go home yet. Against his better judgment, he agrees to take a spoiled prince into the Qaharadin Marshes, a treacherous place all sane men avoid. After arriving at a deserted temple, the prince vanishes within. When a column of blue fire erupts from the temple and pierces the heavens, Kian rushes to help. What he finds emerging from the temple is not the prince, but a horror unleashed from the Thousand Hells. Now Kian must draw upon all of his strength, courage, and skill to survive—because if he dies, the world dies with him. Shadow and Steel coming April 2013! To ask other readers questions about The God King, please sign up. Posted by Ella Medler at 09:45, February 4th 2012. This book had me fooled. It claimed to be a debut novel and yet, right from page one, the writing style showed the energy and maturity of a well-seasoned writer. James West picked up the simplest human story, seen so many times under many guises throughout history, and fitted it inside the most amazing fantasy world I’ve ever read about. The clear description draws you right into this foreign land – you struggle though the desert, your breath catches with the dread of what’s been unleashed here, you can see the fires and feel the demons passing a little too close for comfort. You hide amongst the rocks praying to make it through alive and cover your face as you push stubbornly through the sandstorm. Your feel weary from the fights and you drag your feet, heavy with exhaustion. There is terror, there is desperation, there is the feeling that there in nowhere to hide and no one to help you and yet, in amongst all this gloomy desolation, James West finds space for hope and love and the unwavering friendship of true friends. It is hard to describe without revealing the whole story quite how realistic this novel feels. I found it very hard, not being a seasoned fantasy reader, to ‘let go’ of the story once I had finished the book. I knew I wanted to write this review, but in order to do that I needed to get some distance. This proved harder to think than actually do. The main characters are so strong, so well thought-out, their actions and emotions so real, that you can’t help but want to live your life alongside them. It’s like you can draw some strength from theirs, like they can lend you a little of their courage and take your hand when you’re scared. They guide you through. And that is in no way limited to this fantasy world. This was an above-average indie fantasy with a decent setting, a self-contained plot (though there are apparently more in the series), and an apocalyptic scope that a Hollywood blockbuster would be proud of. It's relatively well written (though, see below) and was just as good as a lot of published fantasy I've read. A few things kept it from being among the top of the indie pile, however. First, the book starts almost in the middle of the turning point that sets the whole thing off, and it would This was an above-average indie fantasy with a decent setting, a self-contained plot (though there are apparently more in the series), and an apocalyptic scope that a Hollywood blockbuster would be proud of. It's relatively well written (though, see below) and was just as good as a lot of published fantasy I've read. A few things kept it from being among the top of the indie pile, however. In the heavens above, the three moons crash together, streaming fire and death in their wake; below, the seas rage as the roiling face of the world shatters. After Prince Varis Kilvar steals powers to transform himself into a god, chaos reigns from the king's city of Ammathor to the forbidding walls of the Black Keep. At his heels marches a demonic army torn from the very bowels of the Thousand Hells, and the risen God King uses terror to stake his claim over all lands. Betrayed and bound to Varis by powers he does not understand, mercenary Kian Valara is forced to masquerade as the world's savior, while a beautiful Sister of Najihar prepares him for his last battle. Victory against a living god is far from certain, but vengeance? For Kian, when the battle rage falls upon his soul and the sword hilt is hot and alive against his palm, vengeance is never out of reach. 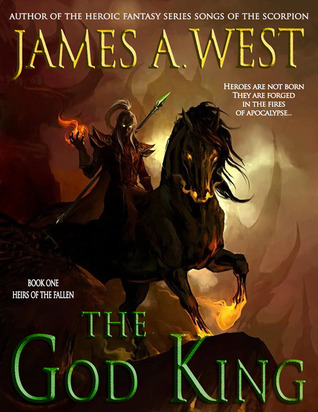 The God King is the first book by James A. West. The book centres on three primary characters, Kian a highly skilled and renown Mercenary, Ellonlef a Sister of Najihar skilled in war nd healing and Varis a Prince set on taking the throne. The God King is a good story that is told through the eyes of three primary characters, each of which contrast and compliment each other well. The story is quite interesting in the fact that you have Varis the pampered highborn, planning to usurp the throne and rule the world. Varis becomes hellbent on killing Kian, the only person capable of stopping Varis and both sides fight over Ellonlef, a woman who Kian falls in love with and Varis wants to keep as his wife. Throughout the story there is fantastic description opening you up for visulisation of the events happening and the horror that is being brought upon the world. Unfortunately at times this detracts from the events though and slows the story a bit to much. The story itself is hard to review as there are quite a few key plot moments that would spoil the story, some of which are very stereotypical of the genre and others are really unexpected which catch you off guard. Overall I think if you are a fan of High Fantasy then this book is definitely for you, as you will become entranced by the description of a world being torn apart and characters just trying to survive and do the right thing. Guarding a spoiled prince on his travels through the country sounded like a fairly simple and lucrative job, but mercenary Kian Valara and his companions hardly expected to sign up for a dangerous trip through the Quaharadin Marshes to a deserted temple in which said prince, driven by an insane lust for power, unleashes horrors beyond imagination from the Thousand Hells. Imbued with immense powers he can barely control, Prince Varis sets out to claim the throne, with an army of the undead in tow Guarding a spoiled prince on his travels through the country sounded like a fairly simple and lucrative job, but mercenary Kian Valara and his companions hardly expected to sign up for a dangerous trip through the Quaharadin Marshes to a deserted temple in which said prince, driven by an insane lust for power, unleashes horrors beyond imagination from the Thousand Hells. Imbued with immense powers he can barely control, Prince Varis sets out to claim the throne, with an army of the undead in tow, leaving death and destruction in his wake. A small tendril of the power let loose upon the world, however, has changed Kian as well, in ways that make him the only one who might stand a chance againt the would-be conqueror - albeit a very small one. The God King is James A. West's debut novel and the first in the Heirs of the Fallen series. I've had the pleasure of not having been disappointed in any one of the five novels I read in May. The streak continued in June with The God King. There seems to be scant few novels these days that are able to grab my attention within the first few pages or chapters, and James A. West showed me that it was still possible. Kian Valara is our hero, albeit very unwillingly. Kian's an Izutarian, a northman from the land of Izutar. The northmen appear to be the same as in any other novel - from a snowy, frigid climate, tough, and with skin as white as snow. Kian's a mercenary, selling his sword to the highest bidder, who in this case happens to be the prince of another kingdom, Varis Kilvar of Aradan. Kian, believing this to be just another job but with an extraordinary payout. He and his comrades, the stone-faced, noble-looking Azuri and the large, jovial Hazad plan to retire following the job, but they planned with no idea what the goal of their charge was. Ellonlef is another primary character and a Sister of Najihar. The Sisters of Najihar are trained in all arts, from scholarly to martial, and Ellonlef is one year from completing her tenure. Our third primary character is Prince Varis himself. Varis's chances of ascending to the throne are minimal, with his father and older brothers in line before him. He desires to change that and vanishes into a mysterious temple, beginning our story. The first chapter involves the breaking of the prison of hell, or as the characters refer it, Geh'shinnom'atar. Geh'shinnom'atar is where the mahk'lar, the shadowy demons of the world were imprisoned. Peropis, Eater of the Damned, plays a major role in the release of the mahk'lar, which subsequently leads to the ascendance of the God King, hence the title. Fantasy is rife with repetition, but most of us readers rarely seem to tire of it as long as the story is told well. West describes locations so that you can easily visualize them and writes situations in which you feel the doom and gloom of the story. Scenes with the mahk'lar are brilliantly done and very reminiscent of Peter V. Brett's Demon Cycle in that they're both very chilling. West is very convincing in his description and as the story progresses we are shown both sides of the conflict which made it very enjoyable. Kian begins the story as the unwilling hero, but he develops throughout the story, proving to us that he is more than just a tough mercenary. Ellonlef, through her training as a Sister, is a prime example of a strong female character in fantasy. In one fell stroke her tedious day to day life is shattered and she is hurled into the brutality of the world. She faces obstacles with courage and determination and she develops just as smoothly as Kian does. The aspect that truly impressed me in The God King was the action. West proves himself to be a masterful wordsmith in describing the scenes so vividly that you can feel the sword nick Kian's cheek or the heat of flames as they sear the earth around him. Combine the great characterization and the fantastic action sequences and you have a fast-paced, gripping read by a new author. I really like the premise of this book. I love the idea of a person being able to transform themselves into a god and the two sides being drawn in this battle. The book is well written with beautiful language. For example, early in the book this description is given: “now its pitted surface was covered in vines, creepers, and witchmoss. Dampness and invading roots had crumbled its stones, giving it the look of an ancient, slumbering beast stricken with leprosy.” I also found my favorite new curse, “You son of a poxy whore!” I love the rich language and descriptive passages. I really wanted to love this book for all the above reasons; however I had a hard time getting interested in the story as it dragged initially. At one point I was so bored I wasn’t sure I wanted to continue reading. Despite loving words and enjoying the unique descriptions, I just wanted something to happen. I would have even been okay with killing people off to get the story moving. Finally after about half of the book, the story picked up. The last half of the book was much more active and held my attention. It was not engrossing like many books I have read, and my son stopped reading after the first two chapters. I would have called this a boy’s book except for the fact that my son didn’t enjoy it and he loves fantasy literature. I would be interested to read something else by James West to see if it was just this story that I had a hard time connecting with, or if it is his style of writing. I do think this story fits a nitch audience, it just wasn’t my nitch. Overall I would give the book 3 of 5 clouds due to the rich language and the promising second half. West, James A. (2011-11-11 08:00:00+00:00). The God King (Kindle Location 185). Kindle Edition. West, James A. (2011-11-11 08:00:00+00:00). The God King (Kindle Locations 210-212). Kindle Edition. The three moons crash and burn and the Sacred Tower falls down. Sister Ellonlef scrambles through the dust and rubble to save the lives of survivors, but this is only the beginning of the end. Magi believe there are no gods. Sisters believe the Creator will save. And Prince Varis believes he’s made a pact with the ruler of demons so he can conquer the world. Meanwhile a troop of mercenaries struggles to survive in the swamp as a God King reaches for his ill-gotten throne. James West’s epic fantas The three moons crash and burn and the Sacred Tower falls down. Sister Ellonlef scrambles through the dust and rubble to save the lives of survivors, but this is only the beginning of the end. Magi believe there are no gods. Sisters believe the Creator will save. And Prince Varis believes he’s made a pact with the ruler of demons so he can conquer the world. Meanwhile a troop of mercenaries struggles to survive in the swamp as a God King reaches for his ill-gotten throne. James West’s epic fantasy novel takes place in a world well-imagined and convincingly described, from forest floor to fallen citadel to fiery seas. The seductive lure of power is equally convincing. And the horror and despair of a broken world creates an enthralling backdrop for this richly-woven tale. The story has a feel of C.S. Lewis in its depiction of human folly and demonic tragedy, or of Tolkein in its hints of symbols and mythology. Quest, love, and sacrifice all play their part in this hero’s journey. A powerful heroine is no stranger to the arts of war. Faithful followers, reminiscent of Norsemen of old, add humor and pleasing dialog. And the powers of creation are unleashed. A well-written fantasy, The God King tells a complete story leaving the reader with a sense of wonder and wondrous power. But the stage might well be set for more, and I hope perhaps the author will offer a sequel. I read this book because it was a Kindle freebie of the day. The reviews were good, so I gave it a shot. James A. West presents a decent fantasy story in the vein of Robert Jordan. It's not as gritty as George RR Martin (on whose work I've given up on) although it does have some ick that is easily skimmed over/skipped. I liked the characters and the fact that in the first chapter the gods were revealed as having been dead a long time. Don't see that twist every day! The sequel takes place 200 yea I read this book because it was a Kindle freebie of the day. The reviews were good, so I gave it a shot. James A. West presents a decent fantasy story in the vein of Robert Jordan. It's not as gritty as George RR Martin (on whose work I've given up on) although it does have some ick that is easily skimmed over/skipped. I liked the characters and the fact that in the first chapter the gods were revealed as having been dead a long time. Don't see that twist every day! The sequel takes place 200 years later, so this is a prologue to the other two books, it seems. I received this ebook free several years ago. I finally got around to reading it. Very good fantasy story. I will probably buy book two in the series. I really enjoyed this book it was fun and full of suspense. The characters were awesome and the story dog you reading. Can't wait to read the next one. I loved the story and the way it was written. The ending left enough to make me want to get the second book to see what else happens. At the outset, I will note a couple of things that under most circumstances might have made me set this book aside—both are issues wholly personal to me and are not likely to speak to other readers. The first is that I am one of those readers of fantasy who does not appreciate the use of the apostrophe for the names of people or things. For example, how exactly do you pronou I was provided a copy of The God King as a free download on Amazon. In exchange, I offer the author this, my honest review. At the outset, I will note a couple of things that under most circumstances might have made me set this book aside—both are issues wholly personal to me and are not likely to speak to other readers. The first is that I am one of those readers of fantasy who does not appreciate the use of the apostrophe for the names of people or things. For example, how exactly do you pronounce Geh’shinnom’atar or Pa’amadin? It’s an odd prejudice of mine that has turned me away from more than one fantasy book or series that I’m sure would have been wonderful to read. Other than the form of such names with which I easily identify—O’Day or d’Artagnon, for example—I just find that reading such names causes me to stumble—over and over again. Thus, I avoid them. The second issue—also personal to me—is that I don’t like “dead people walking.” Whenever a story includes any sort of “zombie” type people—those who cease to live yet are somehow infused with the ability to continue on—I just get the creeps. Both issues were present in The God King and so, I might have put it down. . . . Heroes are not born; they are forged in the fires of apocalypse... Mercenary Kian Valera wants nothing more than to retire from a life of blood and butchery. But when an arrogant princeling offers him enough gold to buy a throne, Kian straps on his sword for one last mission. And besides, what could be easier than guarding a prince who wants to sow his royal seed in every backwater fortress and village throughout the realm? Turns out, dying would’ve been easier. I downloaded this book as a free download so would I expect it to be a good well woven tale with no proofing mistakes? You can bet your life I would just because a book is free does not mean it has to be full of errors or to have a bad unreadable story. James A. West is a great Story-Weaver and I suspect will become a master of his craft. This Story-Weaver (James A. 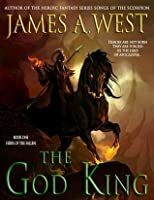 West) has shaped a respectable, enjoyable, fantasy story, which held my attention from start to end gathering momentum until the ending at which I wanted more and indeed I did download book 2 (Crown of the Setting Sun (Heirs of the Fallen Book 2) of this interesting and intriguing world of James A. West and his well-developed characters. The ancient struggle between good and evil is the basis of this story, and as I have said it is well written has an excellent plot and utterly interesting, enthralling and well developed personalities on both sides of the battle. The weaving of this tale is exceptionally expressive from time to time to the disadvantage of the story, there are areas in the story that the explanation takes up too many pages starts to delay the story from proceeding as fast as I would have liked. In conclusion, I do say that this book is worth the read especially if you enjoy the fantasy genre and as I said I am now already reading book 2 of this very enthralling world created by a great Story-Weaver. I’m not sure what to think about this book. It was a nice, rather quick read but there were elements that annoyed me. The biggest of those is the love in it. To avoid spoilers I will not say too much about it, but for me it happened too quickly. While it wasn’t exactly instant love or love at first sight, it was still too close to it. I like to see people fall in love slowly. Sometimes the book feels rushed. There are no subplots or whatsoever and because of this, the book lacked depth. The main I’m not sure what to think about this book. It was a nice, rather quick read but there were elements that annoyed me. The biggest of those is the love in it. To avoid spoilers I will not say too much about it, but for me it happened too quickly. While it wasn’t exactly instant love or love at first sight, it was still too close to it. I like to see people fall in love slowly. Sometimes the book feels rushed. There are no subplots or whatsoever and because of this, the book lacked depth. The main character, Kian, sparked my interested from the beginning but for some reason, I lost my interest in him as the book progressed. I had the feeling there was no evolution and his motivation to do what he is going to do, is also a bit shallow. Hid companions, however, were great characters. I loved their quirks and how they supported Kian. I’d like to hang out with them! The reason why I finished this book is because I enjoyed the writing and the plot was very interesting though I saw more potential in it. West’s writing style is fluent and he managed to make every scene interesting. I’m not sure if I will continue this series because I still have so many to read and the remainder of the series won’t be high on my list. If you want a quick, engaging fantasy read, I encourage you to pick it up but if you’re going to enjoy it depends on what you like and how critical you are. Another Fantasy win for me with this book. It has a well-thought out world and characters. Something very important in Fantasy novels is that while being fantastical, everything is still believable within the 'rules' of the world. That stands true for The God King. Kian is a born-tough kind of man. He's survived many physically and mentally trying things in his life. He may not be leading man handsome, but he draws you into the story all the same. I really liked his history and relationship with Another Fantasy win for me with this book. It has a well-thought out world and characters. Something very important in Fantasy novels is that while being fantastical, everything is still believable within the 'rules' of the world. That stands true for The God King. Kian is a born-tough kind of man. He's survived many physically and mentally trying things in his life. He may not be leading man handsome, but he draws you into the story all the same. I really liked his history and relationship with Hazad and Azuri. They have gone through many things together throughout their lives that have formed a brotherly bond. Not to forget the female lead in the novel, Ellonlef. She is capable, strong and smart. A woman you can root for and not be annoyed by :-) She finds herself tied to Kian in unimagineable ways after he saves her from being captured by a group of less than savory men. She starts him on his path to stop the evil Prince Varis, now known as The God King, before he destroys the world as they know it. I hadn't read a fantasy book in a while when I picked this book up on my kindle. For some strange reason this book really made me want to read The Game of Thrones series. It also made me want to read The Name of the Wind by Patrick Rothfuss again. I liked this book alot but I give it a three because of the format I had to read it in. I had pdf and on my kindle I can't read pdf files because the writing is so small and when I zoom in it's just a big mess. So I have to read pdfs on my laptop and th I hadn't read a fantasy book in a while when I picked this book up on my kindle. For some strange reason this book really made me want to read The Game of Thrones series. It also made me want to read The Name of the Wind by Patrick Rothfuss again. I liked this book alot but I give it a three because of the format I had to read it in. I had pdf and on my kindle I can't read pdf files because the writing is so small and when I zoom in it's just a big mess. So I have to read pdfs on my laptop and that makes me take FOREVER to finish books. If I had read this book either on paper or as a .mobi I would give it a four, maybe even a 5. I stumbled upon The God King while searching for fantasy books, and decided to read it. I am so glad I did; this book is fun! It is very well done, and it pulled me in from page one. The story flowed well; I was never bored. There was a lot of action and suspense, but it also has very in-depth characters. There are strong, tough men but there is also a really cool strong woman. The author was very good at making me care about them. I also LOVED the setting for this book; it has an ancient Middle Eastern setting which was very original to me. If you want a fast-paced fantasy, I definitely recommend The God King. I am excited to see more work from this author. An overall enjoyable read, though it does fall flat in a few places. I enjoyed the interesting portrayal of a fantasy-setting apocalypse, and found the characters to be likable, if a bit one note. However, despite the the apocalyptic setting, and the authoring doing everything he could to convince me that the main villain was powerful, I never really felt that the protagonists were in any real danger ((view spoiler)[Mostly 'thanks' to Kian's mysterious power that tended to pop up at the last sec An overall enjoyable read, though it does fall flat in a few places. I enjoyed the interesting portrayal of a fantasy-setting apocalypse, and found the characters to be likable, if a bit one note. However, despite the the apocalyptic setting, and the authoring doing everything he could to convince me that the main villain was powerful, I never really felt that the protagonists were in any real danger ((view spoiler)[Mostly 'thanks' to Kian's mysterious power that tended to pop up at the last second to save everyone throughout the entire book (hide spoiler)]). I downloaded this book for free. I'm not the biggest fan of fantasy but I do enjoy switching things up from time to time. That said, I downloaded The God King by James A. West. The story is about a Prince with very little hope of ascension who seeks out fabled power and finds it. Unknown to him this power comes with a cost and his more base attributes in conjunction with this desire to prove his is a god wrecks havoc on his his nation and its immediate neighbors. Naturally, where there is evil be I downloaded this book for free. In my opinion, this wasn't a half-bad fantasy. It was a quick read with likable characters, though somewhat underdeveloped. I wish we would have spent more time with Kian and less with Varis. It would have helped me ease into the romance between the two protagonists. As it is, the romance was a little quick, though what love story in a fantasy book isn't? I think some of the descriptive passages were amazing, and it flowed well for me. I was able to picture each scene clearly while using my own i In my opinion, this wasn't a half-bad fantasy. It was a quick read with likable characters, though somewhat underdeveloped. I wish we would have spent more time with Kian and less with Varis. It would have helped me ease into the romance between the two protagonists. As it is, the romance was a little quick, though what love story in a fantasy book isn't? I think some of the descriptive passages were amazing, and it flowed well for me. I was able to picture each scene clearly while using my own imagination. Great balance, in my opinion. Despite the usual typos of a free Kindle version of a book, I found this to be an engaging, intelligent fantasy adventure. It has the usual elements of a reluctant unkillable hero and his loyal sidekicks, a brave and beautiful romantic interest, and the 100% evil and ugly antagonist. The imaginary lands are skillfully described, and, of course, it leads to a sequel. It satisfied my escapist tendencies and helped in the wait as another eon passes before the next installment of George R. R. Martin' Despite the usual typos of a free Kindle version of a book, I found this to be an engaging, intelligent fantasy adventure. It has the usual elements of a reluctant unkillable hero and his loyal sidekicks, a brave and beautiful romantic interest, and the 100% evil and ugly antagonist. The imaginary lands are skillfully described, and, of course, it leads to a sequel. A good adventure story along the lines of old-style D&D, though with not much thought given to the details of the magic, only vague allusions to energies. The people wielding the power do so as a means of furthering the plot, not as any real learning. The result is the creation of an enemy that is entirely too powerful too quickly and dealt with unbelievably. Still, there's fun to be had and the characters are human enough to connect with. This is a good, entertaining, fantasy novel, that builds its momentum and delivers a great ending. I found the start slightly obtuse, with perhaps too many adjectives in Chapter 1, but it feels like the writer relaxes as the story progresses, so his style loosens up and this happens less (they are used more effectively) and the story can build. One or two minor typos in the edition I have. A good holiday read. Would recommend. Nice, captivating read! Really didn't want to put it down most times. The main characters were nicely done, as was the story line. The author made good use of filling in the fine brush strokes to help add great depth to the story as well. All in all I really enjoyed, kinda looking forward to the next installment! James is a native of the Pacific Northwest, but life is a road of many turns. He served i James A. West is the bestselling author of the ongoing epic fantasy series Heirs of the Fallen, and the heroic fantasy series Songs of the Scorpion.